First things first! The winner of Roxana Illuminated Perfume’s GreenWitch solid is Joy. Thanks to all who entered, I loved reading your comments and I know Roxana did too. The soil here in the Northwest is saturated from months of rain and I am seriously hankering for scads of sundrenched flowers blooming in my garden. The mix of rich soil and petals basking in the sunshine will permeate the air here in Portland, but not until July rolls around. Today the sun was shining beautifully and has me anticipating the warmth of summer. And you know what that means, it’s time to bring out a sunny, feel-good perfume for the interim. I have been wearing Garden Walk a lot these past few weeks, yet it’s more than a feel-good floral. It certainly has its fair share of flowers as osmanthus and neroli fill its heart, but it also has a woody depth that simultaneously plays with a flirtatious effervescence. Garden Walk begins with petitgrain’s citrusy topnotes and some earthiness from orris root, then shifts into the aforementioned floral heart. The grounded earth tones recede briefly in the middle, only to present themselves again in the form of hay, ambrette and a hint of honey absolute. This triad forms the foundation of Garden Walk which gives it that sunbaked sweetness of dried grass in a meadow full of wildflowers. 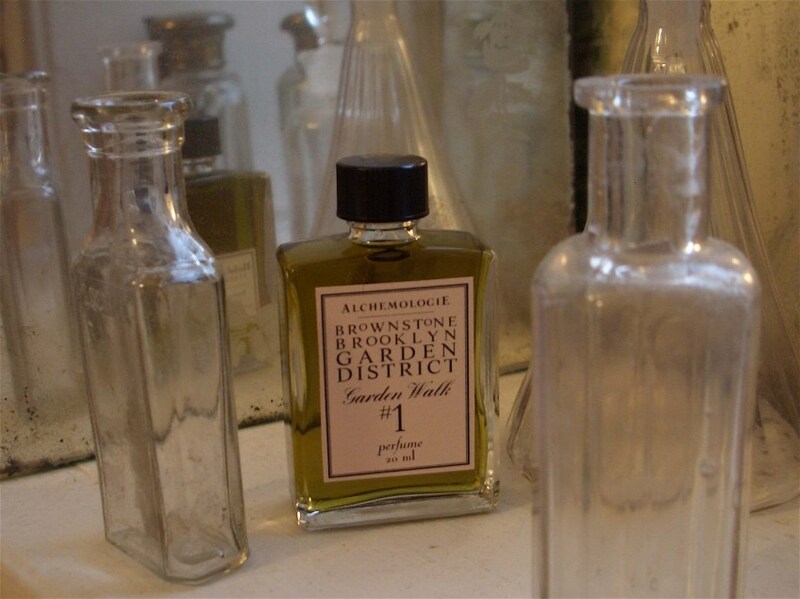 Julianne Zaleta, the creator of Herbal Alchemy, credits the Brownstone Brooklyn Garden District’s Annual Garden Walk as her inspiration for this lovely perfume. I imagine friends strolling through vibrant gardens on a warm summer day, taking in the gorgeous blossoms as wooden fences teeming with the sun’s heat emit their balsamic scent. Ideally, the Garden Walk ends with lunch at an outdoor cafe over tall glasses of iced tea and conversation dominated by what flowers they most admired. Those leisurely days of summer will get here at some point, but until then, this all natural perfume made in Brooklyn will provide me with a lingering honeyed warmth. Garden Walk is available at Herbal Alchemy’s etsy shop. $45 for a 20ml bottle. A sample trio set which includes Garden Walk and Tourmaline (see link for Scent Hive review) is also available. $9 for three samples. Disclosure: A sample was sent to me for consideration by Herbal Alchemy. The opinions in this review are my own. I was not financially compensated for this review or any other. I have had this on my list for a little while! Thank you for the review and reminder Trish. My pleasure Nikki 🙂 Tourmaline is also worth a gander! Thanks, Trish, for such a lovely and generous review! How nice to see a review of Julianne’s lovely creations. Thank you for the wonderful review. Julianne is very talented. We had a lovely afternoon creating this custom fragrance with her. This was a lovely review. Thank you. I look forward to trying this wonderful perfume. I think her sample set is a great way to go if you want to get a good feel for Herbal Alchemy. Thanks so much for reading! This one wasn’t on my radar screen yet, and it sounds so lovely! Thanks for bringing it to my attention. You are so welcome! I think you’d really love her work. I’d never heard of this before – sounds delightful! It really is A, pretty and elegant! I just got a sample of this, and put down my impressions before re-reading your review. 1) Mellow flowers with earthy dirt/stems. A little bit of spicy carnation. 2) Round, cheerful floral mix. Cultivated flowers, no weedy elements. Nothing sneezy, heady or indolic. 3) Buttery, muted gardenia-type smell. 4) A whisper of spun sugar. Everything else flees within 2 hours, but this remains. So, I guess that 1 was the petitgrain/orris, and 3 and 4 must have been the neroli, honey and ambrette. This is what I think of when I imagine an “earthy floral.” I love it! I am so sorry for the delay in responding to your wonderful review/comment!! Thank you so much for sharing your thoughts. I love the “whisper of spun sugar” and the spicy carnation hit you got. I must go back and wear this one immediately! It’s been a while.